We visited this park on April 7, 2015, and stayed for 14 day(s). If you’re traveling along the I-59 in northeastern Alabama and are looking for a place to stop whether for just for one night, a couple of days or a couple of weeks add Wills Creek to your list of places to stay. 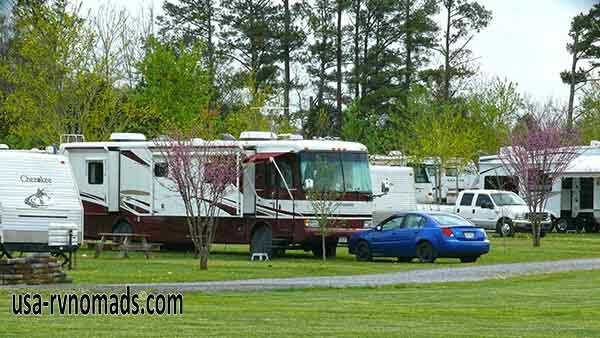 This is a small family owned RV park that is just off I-59 in Ft Payne, Alabama that has 44 sites 50 amp/FHU, all but seven are pull thru. The sites are long, but you’ll be comfortably close to your neighbors on either side. Roadway and parking pads are gravel with grassy areas in between. Picnic tables are provided. Plenty of green space in this park and the owners work very hard to keep it neat, clean and maintained. The laundry is nice and clean and the prices to use the machines is affordable. The bathrooms are also clean and well maintained. A covered pavilion in the middle of the large grassy area is suitable for large family or group gatherings. There are plenty of shopping opportunities and tourist attractions in Ft Payne and surrounding area. A Walmart Supercenter is about two miles form the campground. Chattanooga is approximately a one hour drive to the north. Our initial plan was to stay here a week, but since our itinerary changed we extended for an additional week. Why? This park met our needs…rockin Verizon 4G connection, good park WiFi (stonger closer to the office), area attractions and close proximity to services and shopping as well as owned by some great folks! Cons: There is noticeable road noise from I-59 and the area surrounding the park is industrial however that noise typically ends at the end of the business day. Minimal television reception…5 channels, no national networks or local news. Pros: Veteran’s Discount. Good Sam’s Park. No obstructions for satellite TV subscribers. Easy to get to and just a short distance from I-59. Big Rig friendly, just be sure to make wide turns when driving through the park.